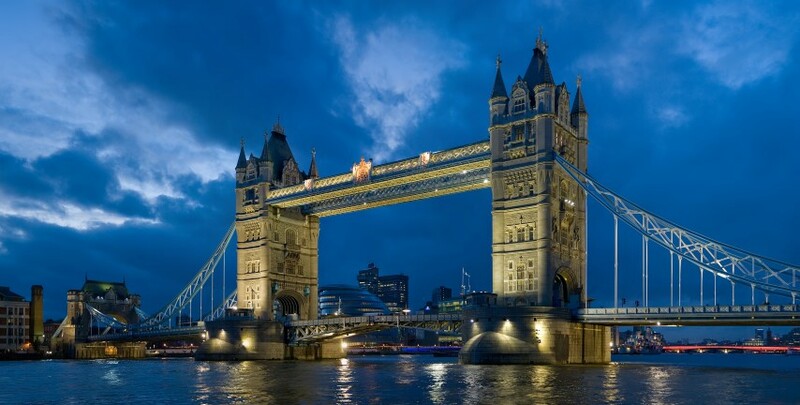 There are over three dozen phenomenal bridges located throughout London, the vast majority of which, not surprisingly, span the River Thames, and many are named after the areas they link. Visitors to the capital will be drawn by some of the more famous structures such as Tower Bridge, and the modern, sleek and stylish design of the Millennium Bridge; a closer look at both of these and lesser-known constructions reveals the deep and intriguing story of London’s development along with its hugely impressive heritage. Today, we reveal more about 10 of the most iconic and fascinating of London’s bridges, which range from Hampton Court in the west to Tower Bridge, the easternmost river crossing within the capital’s boundaries. Immortalised in the Children’s nursery rhyme, London Bridge has existed in one form or another since the Roman occupation of Britain two thousand years ago. A wooden construction was placed over the Thames and rebuilt in medieval times, the design even incorporating public dwellings; King William II paid for its maintenance through taxation. The ascent of Henry II to the English throne in 1154 led to a surge in building projects; although much of the realm’s efforts concerned the expansion of his empire and the replacement of castles erected by his opponents, the capital’s bridge was also earmarked for improvement. In 1176 Peter de Colechurch was asked to design a new stone bridge, a construction which was completed in 1209 and was to survive for over 600 years. With superior access for traders and travellers wishing to cross the river, the area soon became a bustling trade centre, adding to the prosperity of the region around Southwark in particular. London Bridge remained the only built crossing point over the Thames until the mid 18th Century, and even featured Traitors’ Gate, a prominent display of severed heads warning of the punishment facing insurgents and those opposing the crown. The bridge also featured dozens of thriving businesses and houses along its length, making it a focal point for the worlds of trade and society to meet. In 1831, the Rennie family completed a new incarnation of the bridge which was to gain notoriety very quickly. Constructed from granite and with less impediment to the Thames’ natural flow, the rising river speeds and the sheer weight of the bridge meant that it quickly began to sink into the riverbed. Finally in 1967 the bridge was deemed unsuitable to bear the increased weight and volume of modern traffic and was sold to an American industrialist named Robert McCulloch, who wished to make it a tourist attraction at Lake Havasu. Rumours suggested that McCulloch mistakenly thought he was buying the much more glamorous Tower Bridge, claims that the McCulloch family later denied. Having shipped the bridge to Arizona, it was rebuilt at Lake Havasu over a three year period, and was opened in 1971. The current London Bridge was completed in 1973, and stands on the site of the previous constructions. 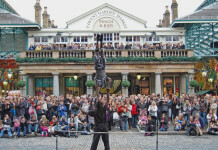 It is one of London’s busiest thoroughfares and has been seen in numerous films and TV productions. One of the world’s most recognisable and famous constructions, Tower Bridge was completed in 1894, and immediately became a focal point for locals and tourists alike. 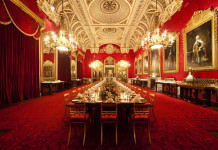 It’s some 800 feet long and is located close to the Tower of London, after which it is of course named. It is a bascule bridge, meaning that its lower span consists of two halves which can be raised to allow larger river traffic to pass under the main construction. The design of Tower Bridge was the result of a competition; more than 50 weird and wonderful designs were submitted for consideration, with the 1884 entry by London architect Sir Horace Jones finally accepted. 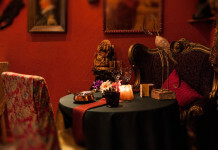 Construction took place over a ten year period, with over 400 workers employed at various stages. The basic framework of the bridge is made from over 11,000 tons of steel, while the support comes from an incredible 70,000 tons of concrete placed in the riverbed. Visitors should seek out the Tower Bridge Exhibition, which was opened in 1982 and is located within the bridge. The Exhibition contains a wealth of fascinating insights into more than a century of London life and allows access to the high level walkways, giving great views of the Thames from 45 metres. When the bridge first opened, the walkways and stairwells became a haven for pickpockets and criminals, and quickly became off limits to most of the public; they were closed to public access in 1910. The Exhibition also houses some of the original machinery used to raise the bascules. While you take in the view from any of these bridges you will notice that there is quite a bit of traffic on the river; a mixture of ships, boats and yachts. You will see plenty of boats belonging to the police and other public services but there is plenty of other river traffic too. London is one of the best cities in the world and attracts some of the worlds richest people. Central London has several marinas such as St Katherine Docks, Chelsea Harbour, Popular Dock Marina, Limehouse Basin Marina and South Dock Marina. Little wonder then that some of the super rich have bought their own luxury yachts and motor boats to entertain on. An arm of Transport for London, London River Services Limited, also licenses a large number of commuter, passenger transport and day trip operations. 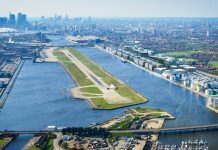 There are also still a couple of ferry services for parts of the river that are too wide for bridges; Canary Wharf to Rotherhithe Ferry and Woolwich to North Woolwich. In modern times, the Bridge’s central bascules are used daily, and are raised around 1,000 times per year. Given the high volume of regular traffic across Tower Bridge, permission to raise the bridge must be sought 24 hours in advance. This generally works well, although there was an infamous occasion in 1952 when a double-decker bus was forced jump across a gap opening ahead of him; fortunately everyone escaped unscathed! Dating to 1769, Blackfriars is one of London’s most interesting bridges, with a storied history. 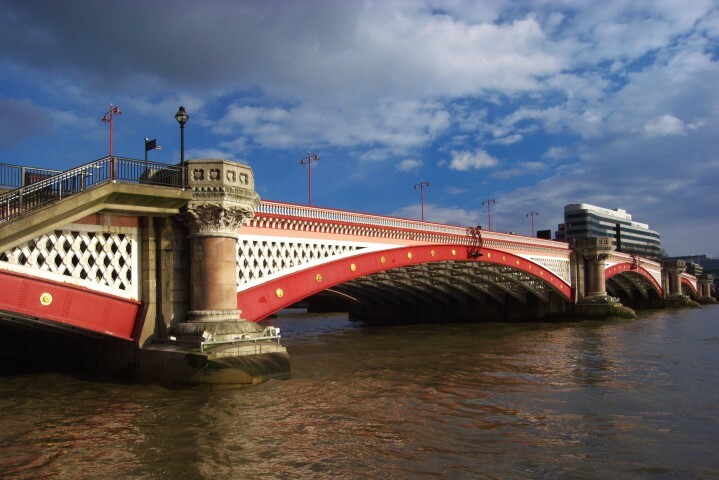 Built over a 9 year period and opened as a toll bridge, the first version was created in Italianate design and was the third bridge to span the Thames in the city. It was actually first named for Prime Minister William Pitt the Elder, but its location adjacent to the Blackfriars monastery meant that it soon became known for its position. Interestingly, the Blackfriar name is derived from the dark coloured garments worn by the Dominican order of monks, and is thus the only London bridge named after a type of clothing! The original stone bridge was not structurally sound, and many repairs were undertaken through its life, especially throughout the 1830s. A new bridge was commissioned to replace the original construction, and this was opened in 1869 by Queen Victoria. Designed by Jospeh Cubitt, the new structure spans some 923 feet and is maintained by the City of London. An adjacent railway bridge was also constructed, but this was later demolished. The bridge saw a huge rise in traffic, meaning that it had to be widened over a four year period, finally completed in 1910. In 1982, the body of Robert Calvi, Chairman of the Vatican Bank and long embroiled in financial scandal, was found hanging from the bridge, a crime that was never fully solved. A happier development followed in 2014, when an ambitious five year project to cover the bridge roof with solar panels was completed. The 4,400 photovoltaic solar panels are expected to provide half of the required energy for the station below, and make the development the world’s largest solar powered bridge and a significant attraction in its own right! 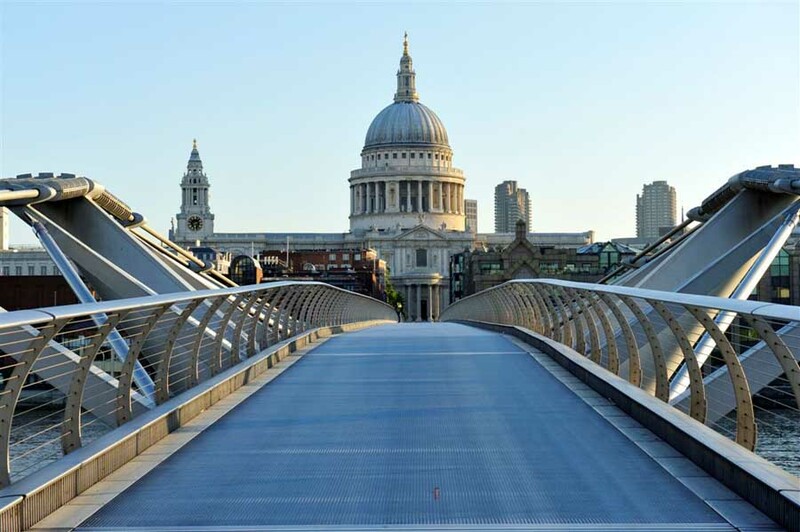 Another iconic London sight is the 330 metre Millennium Bridge, which was opened in June 2000. 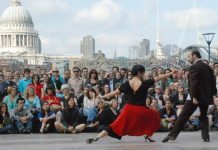 It spans across the Thames between two major public attractions, the Tate Modern on the south side and St Paul’s Cathedral on the north. Plans for a crossing at this point had been envisaged since around 1920, but construction didn’t begin until 1999. It was the first pedestrian footbridge across the Thames constructed since the 19th Century, and its design was subject to a competition organised by the Financial Times. Despite a highly innovative design and rapid construction, the Millennium Bridge had initial problems; it was prone to swaying and rapidly gained the nickname “wobbly bridge” due to its lack of rigidity. Just two days after its original opening, the bridge was closed while engineers worked to remedy the cause of the problem; much publicity ensued when some suggested that the public was causing the issue by “walking the wrong way across the bridge”. The £5 million solution took almost two years to put in place, with the bridge finally re-opening to the public in February 2002. Film buffs and Harry Potter fans will recognise the Millennium Bridge as it was spectacularly destroyed during the 6th movie in the series, “Harry Potter and the Half-Blood Prince”. Voldemort’s followers terrorise the capital and create a swathe of destruction across London – thankfully the real bridge is still safely standing! Constructed in 1873 at the behest of Queen Victoria’s consort Albert, this is among the city’s oldest standing bridges and has never been replaced, one of only two road bridges to remain in its original form. It incorporates both cable-stayed and suspension bridge elements in its design and has often been described as one of the prettiest of London’s river bridges on account of its decoration and illumination. The bridge links the affluent borough of Chelsea to Battersea on the south bank; it is over 700 feet long and encompasses delicate design elements such as lanterns and classical pagodas. It is painted in unusual colours and since 1992 has been illuminated at night by more than 4,000 lightbulbs – partly to enhance its appearance but also practically to avoid boats and ships from colliding with its low central span. English Heritage designated the bridge as a Grade II Listed building on accout of its quirks and strong design elements. As might be expected, the 19th century bridge struggled under the growing weight of modern traffic, but calls for its replacement after the Second World War were resisted. By 1973 the bridge had been fortified with concrete supports, meaning that it is now more able to cope with limited, tightly controlled traffic. It has been nicknamed the “trembling lady” due to the vibrations that would occur when large groups of people crossed. Visitors to the bridge can still view signs that ask bodies of troops to march out of step should they need to cross! 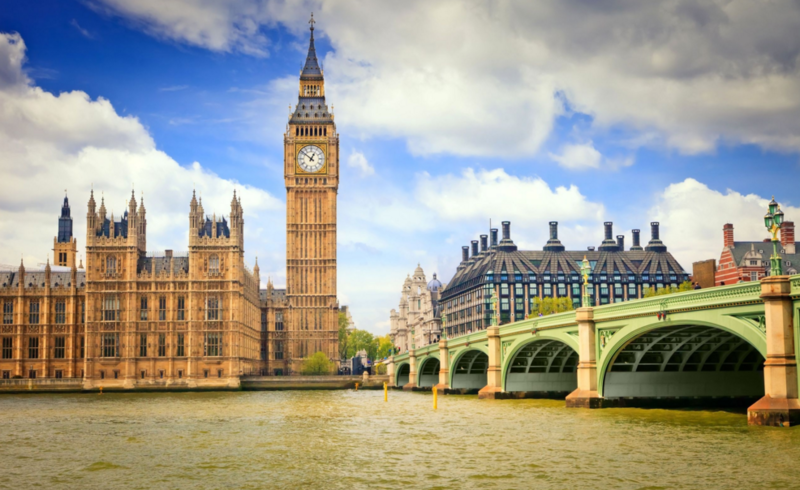 If you wish to take in as many of London’s most popular and recognisable sights in a short space of time, make Westminster Bridge the focal point of your itinerary. Plans to cross the Thames at Westminster were first mooted in 1664, but rejected several times. Finally gaining approval from Parliament in 1736, the first Westminster Bridge was built over an eleven year period and opened in 1750. Its position reflected the need to link trade and industry with the developing south side of the river and to ease traffic congestion on the existing bridges and thoroughfares. Such was the range of views visible from the bridge in its early years that the poet Wordsworth was moved to write that the aspect was “touching in its majesty”. 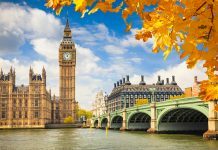 Today visitors can see the majestic Houses of Parliament and Big Ben at the north end and the popular attractions around the London Eye immediately adjacent to the bridge on the south bank; many of London’s most popular visitor attractions lie extremely close by within a short walk or drive. The bridge remains the oldest Thames road crossing in the city. The original structure proved expensive in its upkeep and the development of structural faults meant that it was replaced in 1862 by the current bridge. Designed by Thomas Page, the new Westminster Bridge spanned over 250 metres and features exquisite Gothic wrought iron detailing and seven arches. Due to its central location and recognisable surrounds, the bridge has appeared in numerous films and TV programmes including 28 Days Later, Doctor Who and the Monty Python series. This London bridge is of course named after the great British victory at Waterloo in 1815, when Wellington’s forces defeated Napoleon. A bridge was actually under construction at the site when the battle took place; it was originally to be called Strand Bridge but was immediately renamed in honour of the military triumph. Upon completion in 1817, the magnificent granite structure had nine arches and was thought to be among the city’s finest developments of its type. As with several other early bridges, structural issues meant that a replacement was commissioned. 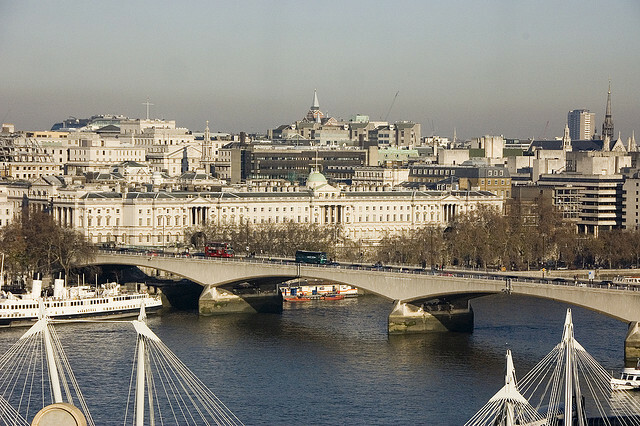 The current Waterloo Bridge was the creation of Sir Giles Gilbert Scott and was opened in 1942; it was mainly built by a female labour force during the wartime years and was hence nicknamed the Ladies Bridge. It was the only London bridge to be damaged by German bombing raids during the Second World War, and was finally completed in 1945. As London has grown around it, the bridge offers fantastic views of key locations in all directions, from Parliament and the London Eye to the towering skyscrapers and structures of Canary Wharf and the City of London. The ability to stand on the bridge and watch the bustle of London life passing by was immortalised by the Kinks in their famous song “Waterloo Sunset”. A river crossing at Kingston has been recorded in one form or another since Roman times, with several sources reporting that Julius Caesar’s forces crossed the Thames there. The area has long been associated with historical deeds and great events; chronicles suggest that 8 old Kings of England were crowned by the river, including Edmund the Magnificent and Ethelred the Unready in the 10th Century. The date of the first permanent bridge at Kingston has been the source of much investigation, with various dates mooted from 1190 to 1224. However it’s certain that a river bridge has been in existence in one form or another since the early 13th century. The first bridge was made of timber, and helped establish the growing town of Kingston as a trade centre. For hundreds of years, repairs and renovations to the bridge took place, until it partly collapsed in 1814. It was finally replaced with a narrow Portland stone construction that began in 1825 and officially opened three years later. It was declared toll free in 1870 to great rejoicing! The bridge has been modernised several times, and now includes bus and cycle lanes and a much wider road, together with an identical bridge alongside added in 2001. Vistitors will enjoy the bridge’s five pretty elliptical arches and the lively riverfront with its many restaurants, bars and shops. Hampton Court Park also lies close by. 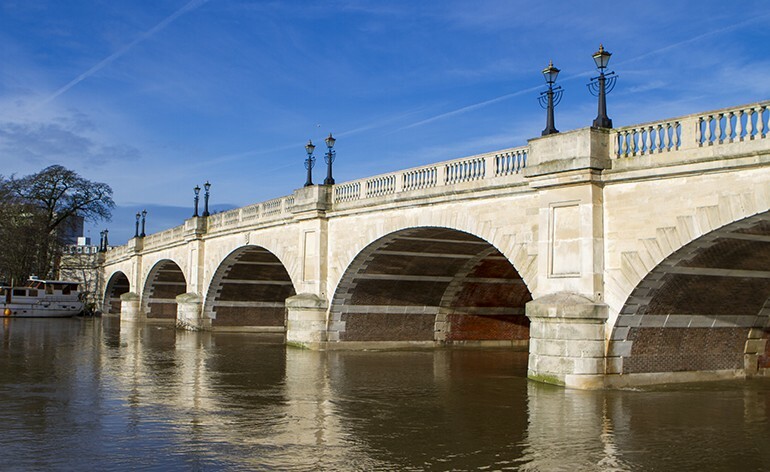 Linking Fulham and Putney, the Putney Bridge is perhaps best known as the starting point for the annual Oxford and Cambridge Boat Race, and is a prime destination for the thousands of visitors who flock to the event each April. The first bridge was erected during the reign of George I and was opened in 1729. It immediately gained notoriety for the heavy-handed toll collectors who would reputedly use staves to beat anyone who hesitated to pay the crossing fare! The bridge was also the only such structure in London linking two churches, St. Mary’s, Putney and All Saints, Fulham. Despite its high use, the bridge was considered generally unsafe and was constantly undergoing repair. Eventually it suffered catastrophic damage in 1870, after a river barge collided with it, and a decision was made to tear down the existing structure and replace it with a new bridge. The 700 feet long replacement was made from granite, with five arches spanning across the river. Opened in 1886, the new bridge was far sturdier, and remains firmly in place today. Visitors can often see a wide variety of rowing crews using the adjacent river all year round, with the four and a half mile Championship course spanning the stretch from Putney to Mortlake. 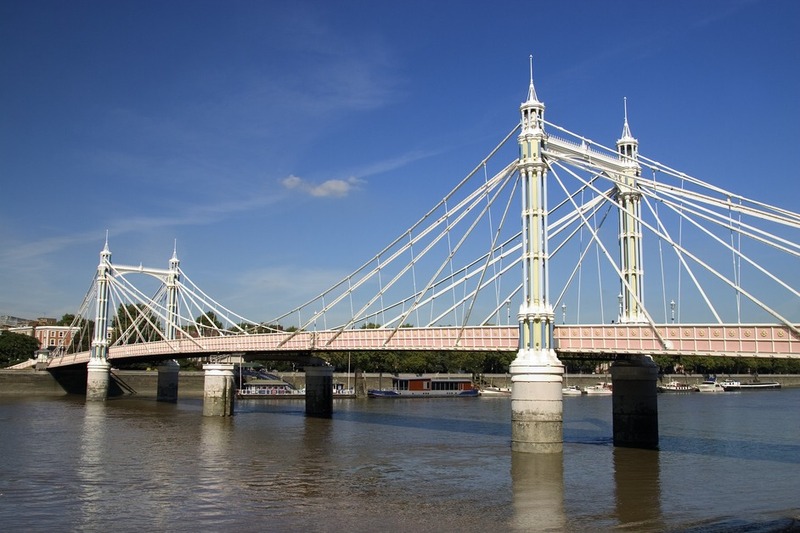 Following an 1824 Act of Parliament, noted architect and engineer William Tierney Clark designed London’s first suspension bridge to reside at Hammersmith, and provide a suitable crossing from Hammersmith and Fulham to the region of Barnes. When the Oxford and Cambridge Boat Race was located to the adjacent stretch of the Thames, the bridge became a focal point for spectators to mass. The sheer volume of pedestrians cramming onto the bridge led to huge safety concerns – an estimated 12,000 spectators were reported to have stood there in 1845 when the race first passed by. By 1882, concerns had heightened and the bridge was closed to Boat Race spectators, and remains shut during the event to the present day. In 1887 the Prince of Wales officially opened the 700 feet replacement bridge, which had been built over a three year period. Designed by Joseph Bazalgette, the new bridge was mainly built from wrought iron. 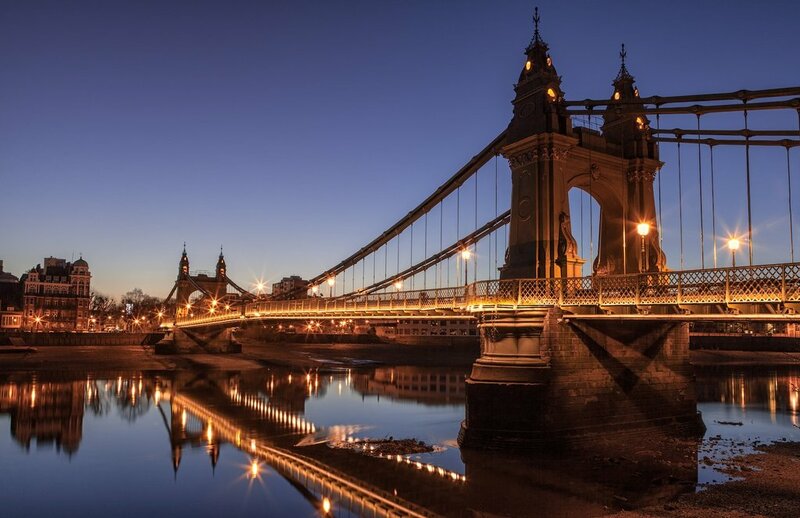 Despite a more modern design, Hammersmith Bridge continued to be plagued with structural issues which continued into the late 20th Century. It was strengthened in 1973 and despite an attempt by the IRA to destroy it, the bridge survived and is used today by a restricted amount of pedestrian and road traffic. It was repainted in its original colours as recently as late 2000, lighting was added, and it is now afforded Grade II listed status. 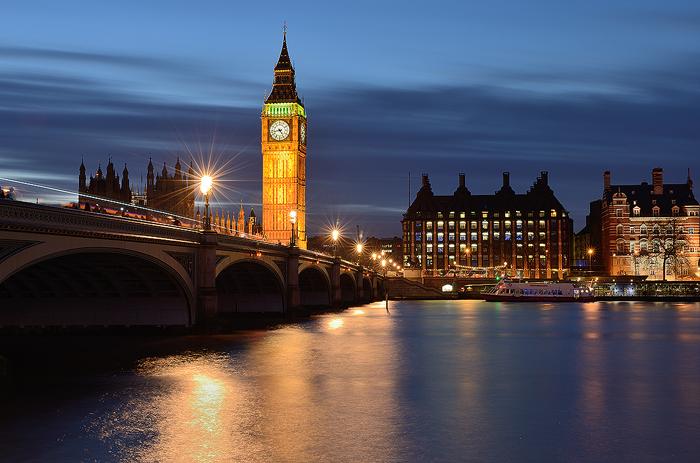 Visitors to London have much to explore to discover the heritage of the city. However, few sights hold as much consolidated history and relatively unknown stories as the many bridges which straddle the Thames. Many of them house museums or monuments dedicated to their rich and varied histories, and there are many exciting stories to uncover by visiting each site. Some two dozen other bridges not mentioned in this article each have their own unique stories to tell.